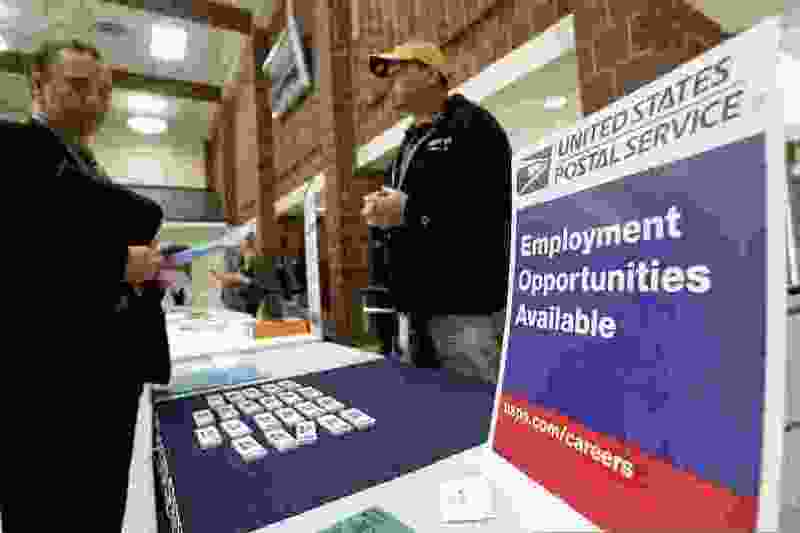 (Keith Srakocic | The Associated Press) In this Nov. 2, 2017, file photo a recruiter from the postal service, right, speaks with an attendee of a job fair in the cafeteria of Deer Lakes High School in Cheswick, Pa. Even with fear of a global economic slump depressing stock markets, Friday, Jan. 4, 2019 jobs report for December is expected to offer reassurance that the U.S. economy remains sturdy and on track to expand for a 10th straight year. I’ve noticed over the years that a lot of people (e.g., Michelle Quist in her Jan. 10 column) have common misperceptions about the United States Postal Service. First: The USPS was established in the United States Constitution — Article 1, Section 8, Clause 7. Second: Taxes do not fund the USPS. The USPS is self-funding. Third: Postal workers are not federal workers, they are postal workers. Fourth: The only financial problems the USPS has are caused by mismanagement by the United States Congress — in this case, excessive front loading of the pension system (amassing very large sums of cash for “future needs”). If the history of other “regulated monopolies” is a guide, the only cure for this problem will be “the free market.” When privatization occurs, those reserves will be distributed as bonuses and dividends to the elite few who just happen to be at the right place at the right time.